BIM a Foodservice Consultants Perspective, Part 1 | Cini-Little International, Inc.
BIM programs allow construction-related disciplines to work together to create a model of a building and coordinate each other’s work, thus resolving conflicts very early in the design process. Everyone agrees this is a plus. However, specialty disciplines are finding it a challenge to keep up with the rapidly evolving BIM world. BIM or Building Information Modeling is a term that describes virtual design, construction and facilities management. The BIM process revolves around 3D building models that share information among various disciplines and enable earlier decision-making, improve accuracy, greatly reduce errors and in general make the process of designing, constructing and operating buildings more efficient. There are several different BIM software programs available, but the program that is most widely used among architects is Autodesk’s Revit software. As with many changes in software platform, there are some universal issues to address. Licenses must be purchased. Training will be needed as the software differs greatly from AutoCAD. Network and ftp site capacity must be assessed (I’ve seen file sizes in the range of 75-100MB and larger projects that are easily two to three times that size). Computers must be upgraded. Bottom line – there is a good deal of time and cost involved in switching software platforms. With all the benefits of better coordination early on and the promise of fewer changes late in a project (translating to a lower chance of overrunning the project), it is understandable why many A&E firms have moved into BIM and have begun using Revit. Revit Architecture was developed specifically for architects with content included to create architectural models. Likewise, Revit MEP and Structure were designed to meet the specific requirements of engineers. But where does that leave a specialty consultant like foodservice? And what are the additional challenges that are unique to the foodservice industry? Families (symbols): The biggest issue is that, with very few exceptions, families are not yet available for the foodservice industry. It will take time and money to create these families. In Revit, families are “intelligent” in that they have embedded information about size, utility, connection requirements, etc. The foodservice industry is currently working on standard guidelines to be followed when creating families to ensure the intelligent data is useful. Groups such as FCSI, NAFEM, FEDA, etc. have become involved. Number of items: A typical foodservice equipment plan contains around 100 different pieces of equipment. Should they be created “on the fly” in Revit or transferred in from AutoCAD? Will the architect want each piece of equipment in 3D? or some combination of 2D and 3D? From the architects I’ve spoken with, this will vary by architect and project. Custom equipment: In foodservice areas, custom items are quite prevalent. Custom families must be created properly to include all possible alternatives. 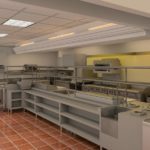 Installation: Will the kitchen equipment contractor be able to work with foodservice Revit files? Training/Support: Most available training is geared to the architect or engineer. Software version: Revit software is not backwards compatible. I suppose all subs will run into this, but we’re going to need several releases of Revit loaded on our computers. We’ll have to carefully manage each project’s workflow so that the same version is used as the architect. The foodservice industry in general is behind the architectural industry with regards to BIM but is moving forward. I’ve been part of the FCSI task force assigned to create manufacturer equipment standards and parameters. I’ve learned new terms such as shared parameters, type catalogs, interference checking and worksharing. I’m excited about where we’re headed. The ability to resolve conflicts such as floor depressions or duct/conduit runs, for example, much earlier in a project will benefit all. Check back for part 2 in a couple of months to see how Cini-Little is addressing these challenges and how we’re progressing in the BIM world.